Bannockburn was originally formed by singer/guitarist Ted Christopher to play to 20,000 of the Tartan Army at Bellahouston Park, Glasgow before live screening of Scotland's world cup games. Played to 750,000 people live on The Mall in Washington DC to open and close the Millionmommarch – America's first huge anti-gun rally. Live TV throughout USA ( Ted Christopher had a UK No.1 with “Knockin' on Heaven's Door” the Dunblane anti-gun song.) The MMM adopted another of Ted's songs “Throw These Guns Away” as their anthem. St.Patrick's Night at The Irish Village Dubai with Bannockburn. 3500 people singing and dancing outside in a beautiful setting. Fabulous weather. Guinness,Whisky and Whiskey. Bannockburn are now regular weel-kent visitors to Dubai. They also play 2 or 3 times a year in Azerbaijan where the band have adopted an orphanage in Baku. Almost the Caley Society's resident band. Ted and fiddler Davie Sinclair have been awarded honorary membership of The Baku Caledonian Society. Thanks guys! The individual members of the band have played in too many countries throughout the world to list but can also between trips be found gigging at home in Bonnie Scotland anywhere from small pubs to any (and all) of Scotland's finest castles and hotels. 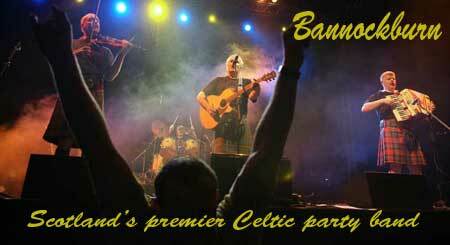 A night with Bannockburn is a real ex-pats nostalgia trip. Energetic versions of many well known Scottish and Irish songs and tunes, some great instrumentals and a few originals to stir the heart. All the band members regularly play straight ceilidhs too so an evening of formal dancing is just as easy.